I say if anyone doesn't like a scone, it's basically because they haven't had a good scone. And a good scone is not dry on the inside. They're lightly crisp on the outside, and soft and moist on the inside. It's almost like the perfect mix of a biscuit and shortbread cookie. And when you glaze them with a vanilla bean icing and sprinkle of raspberry dust (crushed freeze dried raspberries), they're irresistible! These start off much like a biscuit. Cutting cold butter into your dry ingredients. Once this is done, I throw in my raspberry dust and add the cream. Mix this together and turn out onto a well floured surface. Top with another sprinkling of flour (the dough is quite wet) and knead the dough about 25-30 turns. The dough will become smoother. Roll it out to about a 1/2" thickness and cut out mini hearts. Place these on a parchment lined baking sheet and brush with more cream. Turn the oven down from 500F to 425F and bake for 13 minutes or until lightly golden brown. Cool on a wire rack. I then make the glaze by whisking together the powdered sugar, vanilla bean paste and milk. Dip the tops of the cooled scones into the glaze and sprinkle with more raspberry dust. The glaze will set in a couple of minutes and then its ready to dig in! This scone is crisp, soft with a great mix of sweet and tart from the raspberry. Perfect with a cup of tea or coffee! My kids couldn't get enough! They make a great addition to any Valentine's Day Brunch! Crush the freeze dried raspberries by placing them in a large zip top bag rolling over them with a rolling pin. Set aside. Using a pastry cutter, cut in the cold butter till the butter is about the size of peas. Add in the Freeze dried raspberries and mix. In a large measuring cup, whisk together milk and eggs. Our into flour mixture and stir with a rubber spatula until just combined. Knead dough 25-30 times on well-floured surface with well-floured hands until the surface of the dough is smooth and doesn't have any cracks. Flour your rolling pin and then roll out dough to 1 inch thickness. 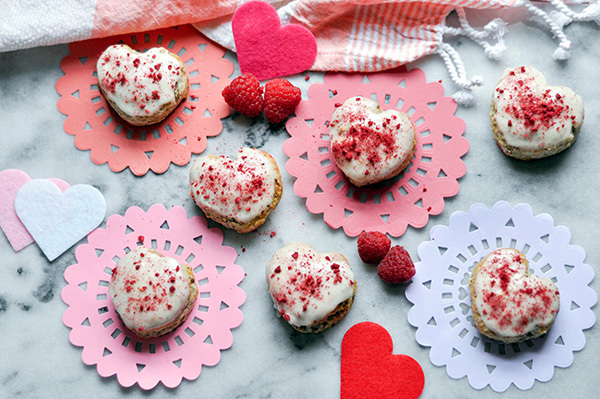 Cut out scones using a 2" Heart shaped cookie cutter. 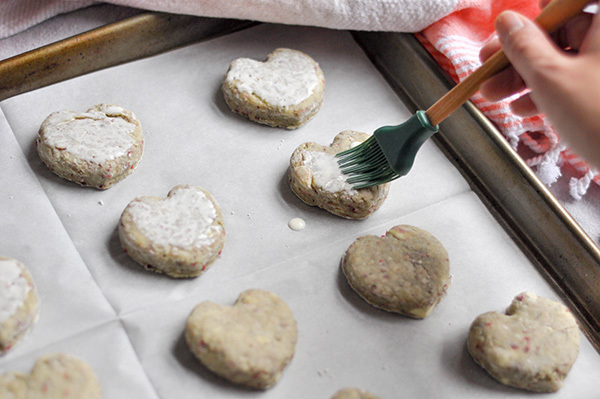 Transfer scones to a parchment lined baking sheet. Gather remaining dough into a ball, knead a few times, then roll it out to 1 inch thickness. Cut out the rest of your scones and transfer to the baking sheet. Brush onto the tops of the scones with the reserved cream. Turn down the oven to 425 F. Bake scones for 13 minutes or until golden brown. While they cool, make the glaze by whisking together the powdered sugar, milk and vanilla bean paste. Dip the tops of the cooled scones into the glaze and place on a wire rack. Sprinkle freeze dried raspberries on top of the wet glaze and allow to set.